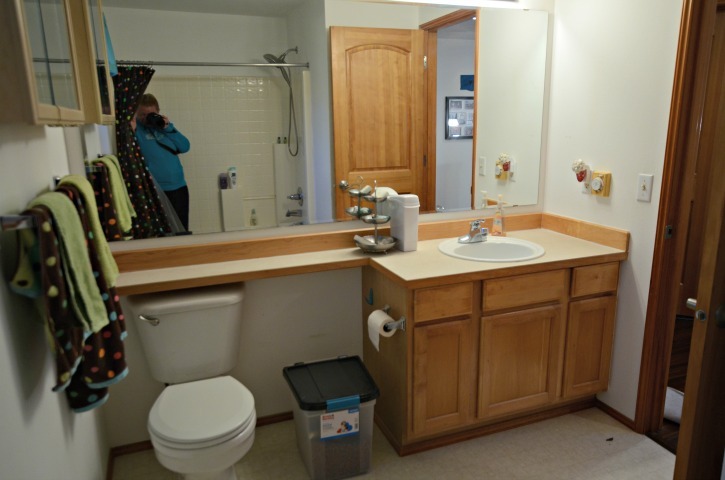 I gave a sneak peek of our bathroom update last week when I showed off our awesome new toilet. 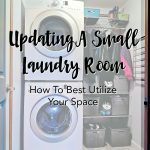 Today, I’m sharing a bit more about how we gave our bathroom a face-lift with minimal cost and work. We completed this project over the course of a few weekends (it probably could have been done in one or two if we didn’t have some events that took up all of a couple Saturdays. 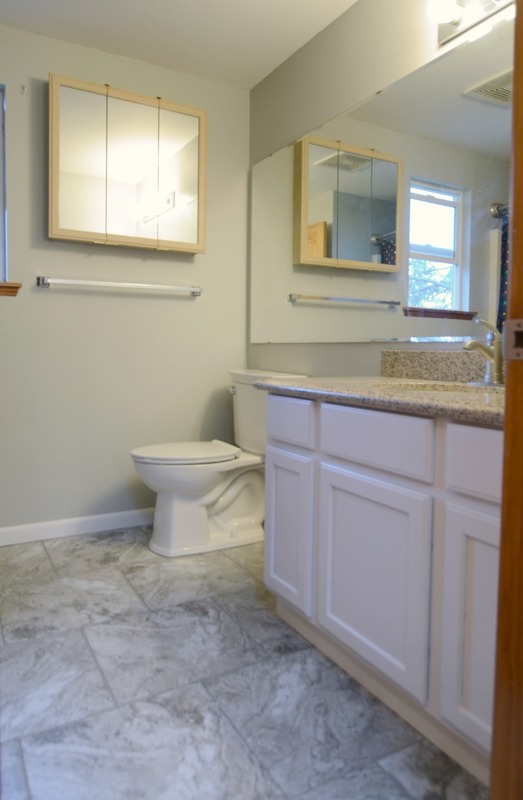 The main changes to the bathroom were floors, vanity, toilet, and paint. I don’t know who thought that it was a good idea to have these overhanging vanity tops, but whoever it is should be fired. When we had to replace the vanity in the downstairs bathroom after our “flood”, I discovered that I couldn’t really find one that I liked. So instead of getting a new one, I simply gave our existing one a facelift. A simple coat of paint and it looks like a whole new vanity. In addition to a coat of paint, we also added a piece of beadboard onto the visible side to make it look a little bit more custom. The granite countertop and back/side splash was from our local granite store and then we added a nice new satin nickel faucet. 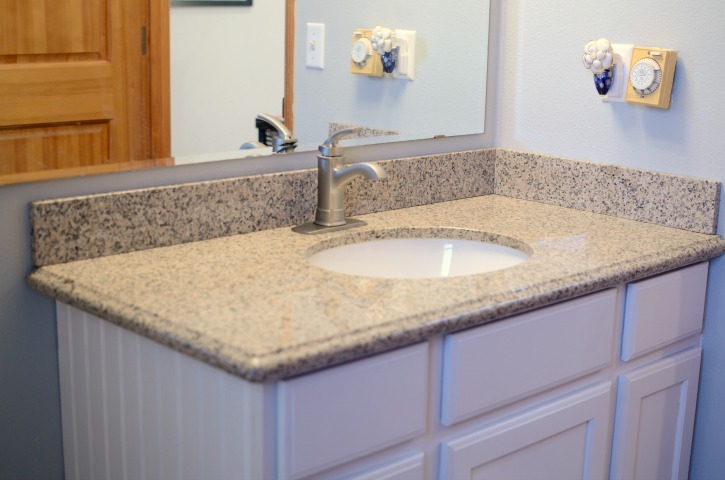 Many granite stores have pre-finished vanity tops so this is an economical way to add some granite onto an existing vanity. For the shower, I opted to add a dual curved shower rod. 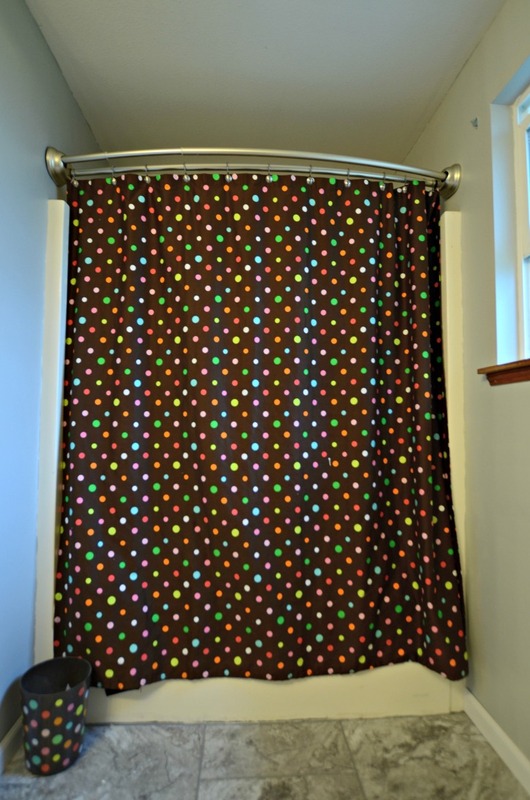 Since this bathroom will primarily be used by kids, I figured the second rod would be perfect for hanging things like towels, shower mats, or clothes as they dry. We also painted the entire bathroom a nice light grey that we have throughout our house (it was great timing to do this while the floors were torn out because it didn’t really matter if we spilled a little paint). I wanted all of our bathroom flooring to match, so I used the same groutable peel & stick tiles from our master bathroom. 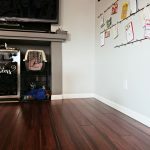 Finish off the floors with some white molding and the bathroom is complete! I love how this bathroom turned out. 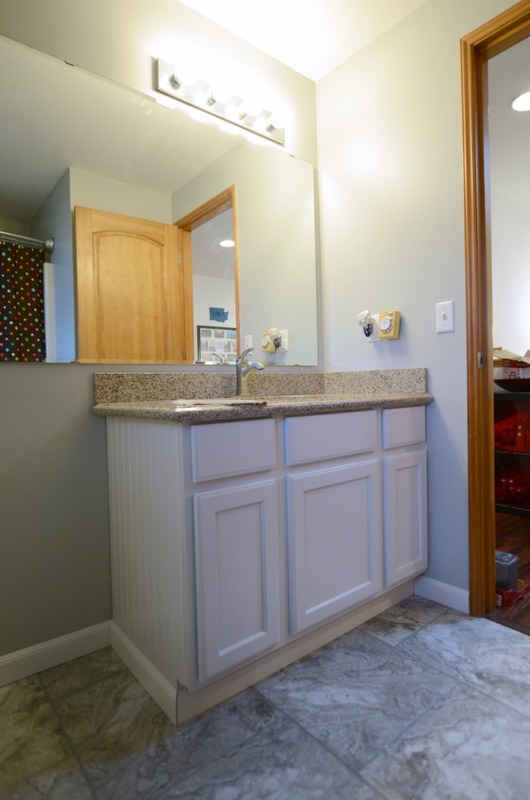 Just a few minor tweaks gave a huge face-lift to a bathroom that needed a little help. We do have a couple “punch list” items left, such as changing the fan from a timer to a switch, and adding a toilet roll holder, but for the most part we are done. 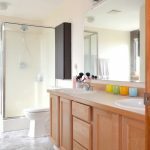 How would you update your bathroom? That’s such an awesome upgrade! 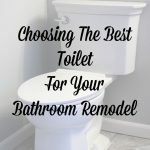 We want to redo our bathroom but can’t agree on anything!